Everything you need to know about BlackBerry's next flagship? Reports surrounding the next installment in the BlackBerry 10 ecosystem have been doing the rounds recently and the latest leak appears to spill the beans on pretty much every aspect of the BlackBerry A10. 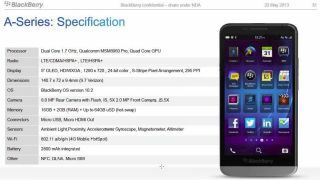 Posted rather nonchalantly by a member of CrackBerry's forum the screengrab in question appears to have been taken from confidential documentation from within the Canadian firm - with the BlackBerry A10 details dated May 23 2013. According to this particular leak, the A10 will rock up sporting the 5-inch display with 1280 x 720 resolution and dual-core processor which previous reports have alluded to. We do get a bit more information on both aspects with this latest revelation though, with the info suggesting the processor will be clocked at 1.7GHz and users will also be greeted with a quad-core GPU and 2GB of RAM. It also suggests BlackBerry will plump for OLED screen technology on the A10, although its touted 295ppi would be lower than both the Z10 and Q10 devices. Other specs the leak supposedly reveals for the BlackBerry A10 include a rear 8MP camera with flash, front 2MP camera, 16GB of internal storage, microSD slot, micro USB and HDMI ports, NFC, DLNA, Wi-Fi a/b/g/n and 4G connectivity - so pretty much identical to the two current top phones in BlackBerry's line up. There's good news for battery fans however with the screenshot suggesting the BlackBerry A10 will pack a 2800mAh power pack into its frame, which will hopefully provide some decent battery life. The BlackBerry A10 may also signal the next update for the BB10 operating system, with the listing claiming the handset will arrive with version 10.2 of the software - we're currently on 10.1. We haven't seen any clear indication of when the BlackBerry A10 may touch down, but November has been bandied about so keep your eyes peeled.